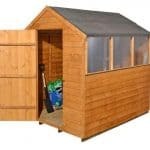 This classic storage shed comes with a range of good quality features. Its reverse apex design makes it really stand out, offering both great additional height and water resistance. The reverse design also means the door and window are situated close together at the front of the building. One feature in particular we find impressive is the hasp and staple secured door. However, you will need to buy your own padlock to benefit from this secure locking system. The door itself has a ledged design, though it isn’t braced. This means it does feel a little on the flimsy side. Black sand felt is supplied for the roof covering which offers a good level of water resistance. There is one fixed styrene glazed window and it has quite a small design so the privacy of the building isn’t compromised too much. 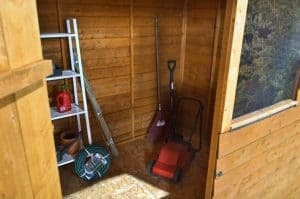 The shed has largely been created with budget in mind, though it does feature quite a few benefits that a lot of other budget sheds don’t come with. One of the main things we like about the building is the fact it has been dip treated. Whilst the manufacturer recommends treating the shed again after assembly, you can get away with only treating the building every other year. 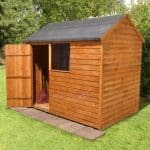 This cuts maintenance costs and allows you to simply enjoy the shed. Solid sheet materials aren’t incredibly strong so may not be suitable for heavy storage. This is a long, tall wooden reverse apex storage shed. Now reverse apex buildings often feature the door on the side of the building. However, as you can clearly see from the picture, this isn’t the case with this shed. The only real difference is that the apex roof runs from the front to the rear, rather than from side to side. The window and door are also placed close together. What really stands out here is the height of the shed. You expect apex sheds to be taller anyway, but this is a lot taller than the average apex building. Measuring a fantastic 7’8”, you are given a substantial amount of height to store really tall equipment. The door height is a little shorter, so if you’re fairly tall you will need to duck a little to enter the building. 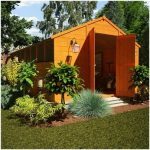 Compared to other 8×6 sheds, we do recommend this one if you want to be able to walk around comfortably. The construction of the roof and floor are pretty standard and feature the same solid sheet materials as most overlap sheds. However, the size and style of the apex roof are pretty unique. As mentioned earlier, this is a reverse apex building so the roof runs from the front to the back of the shed. This doesn’t affect its great water resistant benefits; it is purely a cosmetic difference. Whichever way the apex roof faces, it provides a fantastic amount of weatherproof protection. Rainwater is automatically directly down the roof, onto the floor. In fact, if anything this roof provides more water resistance than a lot of apex buildings due to its additional height. It has also been covered by black roofing felt which is supplied free with the shed. We would advise buying a thicker, stronger felt however as like most outdoor buildings, the one supplied with this one isn’t exactly the best quality. However, it could provide great short term protection. One thing we do feel the need to warn you about is the strength of the floor. Solid sheet materials make a good basic floor, but they are not very strong. Even just looking at it, you can tell it isn’t designed to hold anything heavy. A lot of manufacturers give you the option to upgrade to a stronger floor, but Shed Store doesn’t. However, they have pressure treated the floor joists which does add some extra stability. Whilst Shed Store use standard 8mm overlap cladding on this shed, they have dip treated it to provide a stronger, more durable structure. 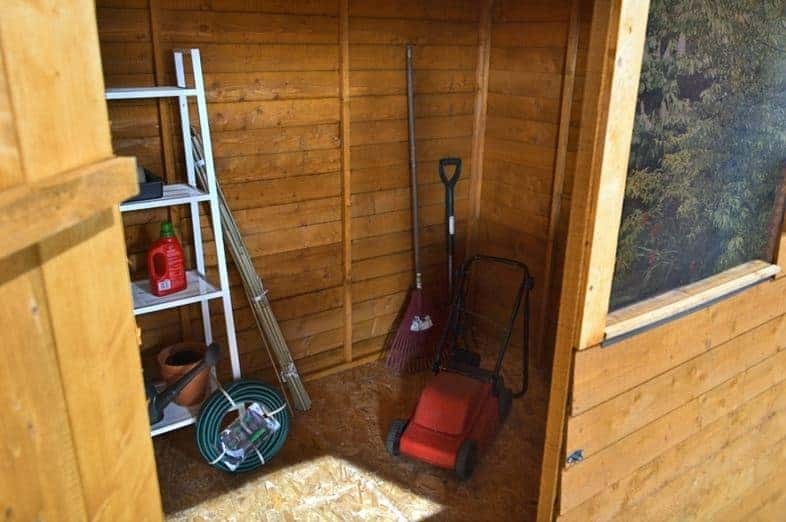 The benefit of this is that you do not need to treat the shed every year. You can get away with treating it every other year instead. This is great news for your wallet and it is also a fantastic benefit for those who are looking for a low maintenance building. Dip treatment consists of four different steps. First the timber is dipped inside a cylinder containing a high quality preservative. Then the treatment is absorbed onto the surface of the wood. The manufacturer then removes the timber from the cylinder and leaves it to dry. As the preservative is only absorbed onto the surface of the wood, it doesn’t provide as much protection as a pressure treated building. However, for an overlap shed this dip treatment is a unique addition that helps to lengthen the life of the building. This also protects the shed from warping. This is usually one of the main concerns with overlap cladding. If the weather is really sunny, it can cause the wood to shrink and therefore affects the stability of the structure. There is no expansion gap like there is with tongue and groove cladding so it can cause significant damage. There’s also a chance that the wood will discolour. So the fact you don’t have to worry about this thanks to the dip treatment is a definite advantage. What we really like about this overlap shed is that it doesn’t need to be treated every single year. This is a unique advantage that is provided thanks to the dip treatment the timber goes through before being shipped. Overlap sheds do tend to need treating after construction and then every year after that. This is because the cladding isn’t very thick and it has quite a rough design compared to tongue and groove or Shiplap. So the fact you don’t need to with this building is fantastic. It also comes with a 10 year anti-rot and decay guarantee. There is a single door and a single fixed window on this shed. The door has a ledge design, though it hasn’t been braced. This means it has a lighter, less durable feel than a braced door. The bracing is installed to stop the door sagging because of heavy use. So if you plan on using the shed daily, we’d highly recommend adding your own bracing just to improve its sturdiness and longevity. What is worth mentioning however is that the door does come with a hasp and staple. This provides a good base for a padlock to be fitted. The fixed window is glazed with styrene, used for its shatterproof qualities. Whilst it doesn’t offer any ventilation into the shed, it does provide great insulation. The one thing overlap sheds don’t tend to offer is a lot of security. Now this isn’t a major problem if you’re not going to be storing anything valuable. However, we’d still suggest improving the security, if only for peace of mind. As mentioned, the door comes with a hasp and staple. This is a good type of locking system which simply needs a padlock to be installed. Whilst a padlock isn’t supplied, they are fairly affordable and there’s a number of different types out there too. For example, you can find padlocks which come with a built in alarm which goes off if the padlock is tampered with. This would provide fantastic security and best of all, they are really affordable. Whilst there is only one window included on the shed, it still limits the level of privacy offered. As overlap cladding isn’t suitable for adding anything like interior shelving or curtain poles, it also prevents you from adding any additional privacy measures. Providing a good quality lock will help with security however, so even if thieves can see what is stored inside, they won’t be able to get to it. Thanks to the customisation and extra options, you can choose to add a sturdy base, colour or lighting to the shed. If you have the budget we’d definitely recommend all three of these options. Firstly there’s the base. If you didn’t already know, it is extremely important to erect any outdoor building onto a sturdy, solid base. This is why concrete is often recommended. However, if you don’t have a concrete base, you’ll find that buying and installing one can be pretty expensive, not to mention hard work! That’s where bases such as the Wooden DIY Base Kit come in. This hardy wooden base is offered with spikes that secure the base down into the ground. It also provides ventilation to the floor, protecting it against damp. What’s really great about this kit in particular, is that it has been treated so that it lasts a minimum of 10 years. Once assembled, the base can be used the same day and it will also make building the shed much easier. 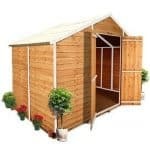 This shed comes with a standard, rustic design, but you can also choose from two different colours. Shed Store offers two coloured water treatments which are easy to apply and they dry really quickly too. They are also easy to clean off with water if you accidentally get them on an area you shouldn’t. Choose from Dark Brown or Harvest Gold. Both offer a stylish finish and will protect the shed at the same time. Finally there’s a really affordable solar light available. This great natural powered light is not only a lot cheaper than an electrical pack, but it also requires absolutely zero wiring. This makes it very easy to add to the building. With no running costs, you are saving a lot of money with this light. Its batteries recharge via a remote solar panel and provide up to 2-4 hours running time in the winter and 6-8 hours in the summer. With 6 strong LED bulbs in each light, you are guaranteed plenty of lighting when you need it. 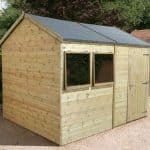 The quality of this shed may not be as exceptional as tongue and groove or Shiplap, but it is still surprisingly good considering it is made from 8mm rough-sawn timber. 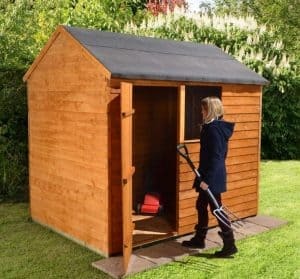 This is one of the more budget models available from Shed Store so its longevity isn’t as great as other similar sheds. The solid sheet floor won’t last long if you store heavy equipment and the roofing felt isn’t great either. 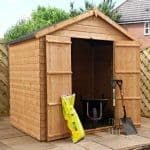 However, with regular treatments, the shed does come with a 10 year anti-rot guarantee which does give you peace of mind. There’s a lot of interior width in the shed, enabling you to store fairly large items. However, you do need to consider that you cannot add any shelving or hooks onto the walls. There are some extra storage units you can purchase which can increase the level of space available so this is something you might want to consider. You should find this building is pretty easy to install. It comes with good, detailed instructions and should take no more than a few hours to erect. 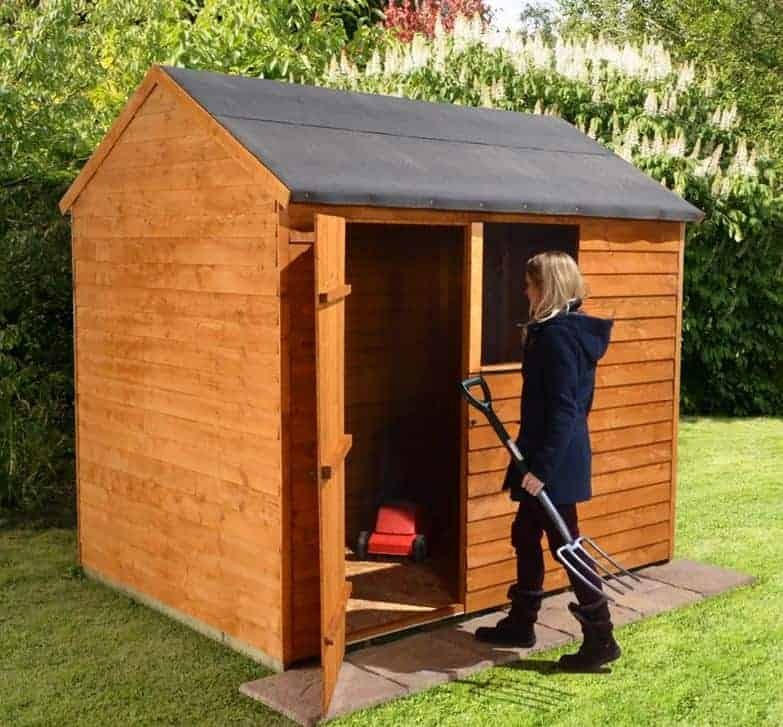 We feel you’re getting pretty good value for money with this shed. The very low initial cost is fantastic, while the features that come with the building are also impressive for an overlap shed. Final Thoughts: If you’re looking for a no frills, generous size storage shed this could be a great option. With its unique reverse apex design, the front of the shed benefits from a wider look, offering a more solid and secure feel. The door is secured with a hasp and staple though you will need to provide your own padlock. As it is dip treated prior to shipment, you don’t necessarily have to treat it again for another year or two. However, it is recommend that you use a high quality preservative after assembly and then annually thereafter. 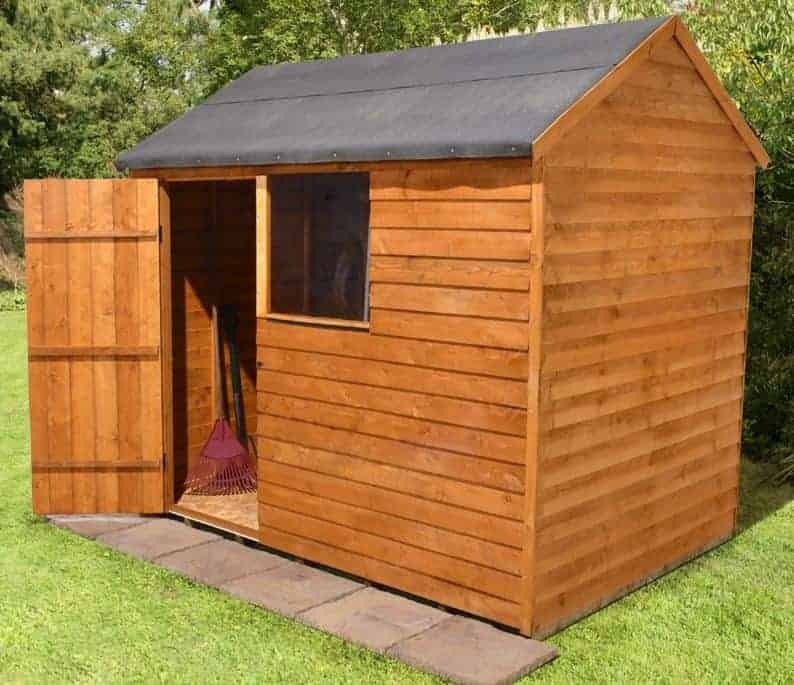 A 10 year anti rot warranty gives you reassurance that this budget shed is truly built to last.